(Mn2+3Al2(SiO4)3; hardness of 6.5 – 7 on the Mohs scale) – garnets are a group of silicate minerals that have been used since the Bronze Age as gemstones and abrasives. All species of garnets possess similar physical properties and crystal forms, but differ in chemical composition. 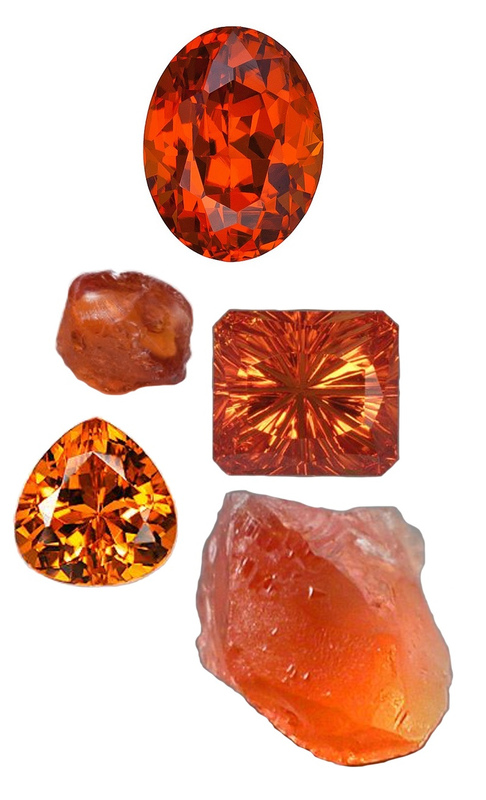 The different species are pyrope, almandine, spessartine, grossular (varieties of which are hessonite or cinnamon-stone and tsavorite), uvarovite and andradite. The name “garnet” comes from the Medieval Latin word, “granatum”, which is an adjective meaning “dark-red”. It is thought that this adjective could have been extracted from the word “pomegranate”, due to the colour of the seed coats or shape of the seeds. However, the word could also have come from another Medieval Latin word; “granum”, referring to red dye. The use of red garnet dates back thousands of years, when it was used by Egyptian pharaohs for both decorative and ceremonial purposes. The ancient Romans also wore garnet rings and traded garnet gemstones. In ancient times, garnet and other red gemstones cut en cabochon were called “carbuncles”, which is not the prettiest of names because it was also used to define pus-filled boils. The Latin word, “carbunculus” alludes to a burning piece of coal or ember. This may have been used to refer to garnet because of its bright colour. Garnet has long been thought of as a travellers’ stone. Garnet is also thought to promote successful business, encourage compassion and aid self-confidence. Garnet is said to have the ability to heal the blood and encourage good circulation. Garnet is the traditional birthstone for January, the zodiacal stone for Aquarius and the second anniversary stone. Garnets are quite tough and durable, though the hardness depends on the type of garnet. For example, demantoid garnets are softer than almandine, pyrope, spessartite and tsavorite garnets. Proper care for garnets includes protecting them from hard blows, which could damage them. To clean your garnets, simply use warm soapy water and a soft cloth. Be sure to rinse well to remove soapy residue. As with most gemstones, ultrasonic cleaners and steamers are not recommended. Always remove any jewellery or gemstones before exercising, cleaning or engaging in harsh physical activities such as sport. Store garnets away from other gemstones to avoid scratches. It is best to wrap gemstones in soft cloth or place them inside a fabric-lined jewellery box.